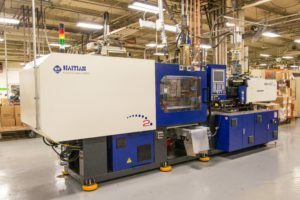 Viking Plastics uses plastic injection molding to create a wide range of components and products, from quick connects and shipping caps to battery cases, commercial appliance parts, and caps and closures. Our processes are designed for high volume — thousands or even millions of units — and consistent quality. Raw plastic (in pellet or granule form) is heated and mixed in the barrel of a molding machine until it is soft enough to be injected into the mold with a ram- or screw-style plunger. The mold, often designed by our engineers and made of steel or aluminum by a toolmaker, can have a single cavity or multiple cavities to produce several of the same unit per shot. When the plastic has cooled and hardened to the configuration of the cavity, the part is ejected from the mold, and the process is repeated. For more than four decades, Viking Plastics has provided high-quality plastic injection-molded products for our customers. Our extensive experience, knowledge and skill enable Viking Plastics to optimize processes from design through first shots and production, which keeps costs low and our defective parts per million (PPM) rate at less than one. Our team of experts includes individuals from diverse molding and manufacturing backgrounds. A representative from every department contributes to every new project and launch, offering a knowledge base that covers all aspects of design and production. And with our company’s lean culture and commitment to continuous improvement, we’re adding to that knowledge base and refining our processes every day. Click below for more information or to find out how Viking Plastics can put our plastic injection molding expertise to work for you.